The AT, at 2,100 miles, attracts some 2,000 hikers a year, of which only 10% fully complete the hike, which is also as many as drop out in the first week. Usually taking 5 months and some 5 million steps, there had been roughly 4,000 people who had completed this gruelling walk at the time Bryson wrote his book in 1997. Putting this into context, this is about the same number of people who have summitted Everest, illustrating that this is one hell of a tough walk. There are plenty of encounters with the wildlife, both four-legged and the two-legged variety, in the form of day-trippers, and with whom Bryson and Katz cross paths with. There's also plenty of banter, both good and bad between Bryson and Katz as you would expect from the two spending such a considerable amount of time travelling in close proximity with each other. However, it is the idiosyncratic details embedded through the book that makes it such an enjoyable read and not simply another I came, I walked, I conquered the trail-type book. A Walk in the Woods succinctly provides geological, ecological and and historical context to the AT and the areas through which it cuts a swathe through. Bryson also imparts a fair amount of knowledge with regards the various ice ages that have occurred through the aeons, in addition to providing his own views on the politics and efficacy of the National Park Service of which he is particularly damning and the saddening environmental issues that plague this beautiful wilderness. 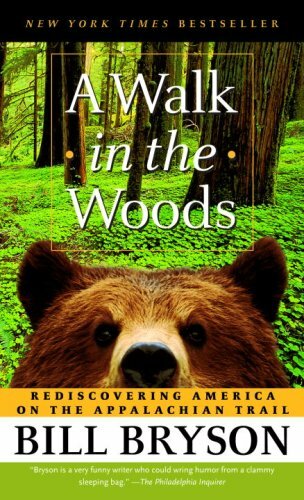 Of course it wouldn't be classic Bryson if he wasn't also inundating us with much needed information on bears, mountain lions, murders on the Trail and any other way in which it is possible to get killed out in the wilderness. A Walk in the Woods is one of those books which you feel like you know before you've even read it. It's also a book I'd put off reading as I genuinely didn't want to be disappointed. However, I needn't have been concerned as Bryson's writing and humour is as crisp as a New England autumnal morning and he describes the Trail and environs so well that you almost feel like you don't need to have that walk in the woods yourself.